Launch of the website OUT OF THE BOX is delayed. We will need another week or two. A Blog will be launched alongside, which will feature loads of reports, interviews and behind-the-scenes stuff around the OUT OF THE BOX audiovisual experience as well as live-looping, compositing and fx things – both visual and audial. Strong and weird the experience to have our musicians playing BEHIND the back-projection-screen was. Musical reactions on the visuals were extremely tight. The effects on the audience also seemed pretty intense to us, but the most baffling thing actually was: the musicians started talking about what they do after a period of 15 minutes or so. In ways and quantity that was far beyond it used to happen vis á vis an audience, but was very entertaining, indeed. It was kind of a forget-the-camera-effect we know from long, situative interviews. We could use more of that, to give away more of the improvisational concept whilst playing. We will audit the audience about their opinion. New ideas coming up next time, don’t miss! Out of the Box Vol. IX coming up! We hereby proudly announce the dawn of Out of the Box Vol. IX! Tim Heinrich with a massive orchestral setup. This he will bring in to live performances for the very first time with us. Given Tim’s skills (sounth.de), we will experience HUGEness in sound. Erika has to weigh in what she’s got to seal it together, picturewise. More Information, mayhap a trailer, will be postet here and there. …we thought, it would be nice to post something, although Erika is on sort of a summer vacation. Actually she is not, recent times were and still are dominated by progress. Ralf fiddles around with massive changes in recent versions of VDMX. At least these changes are more than welcome and the new core-i-macbook brings in an enormous performance-boost also, so it is pretty much fun. Avenue still runs great on the core2. CoGe goes commercial, for now we will stick with the old Beta v3. Our beloved project “Out of the Box” matures. The rare combination of avantgarde electronic music and real-footage based visual compositing with highest degree of improvisation on both sides has long left its experimental stage. So we took some time with our fellow boxers to find ourselves and get things clear. 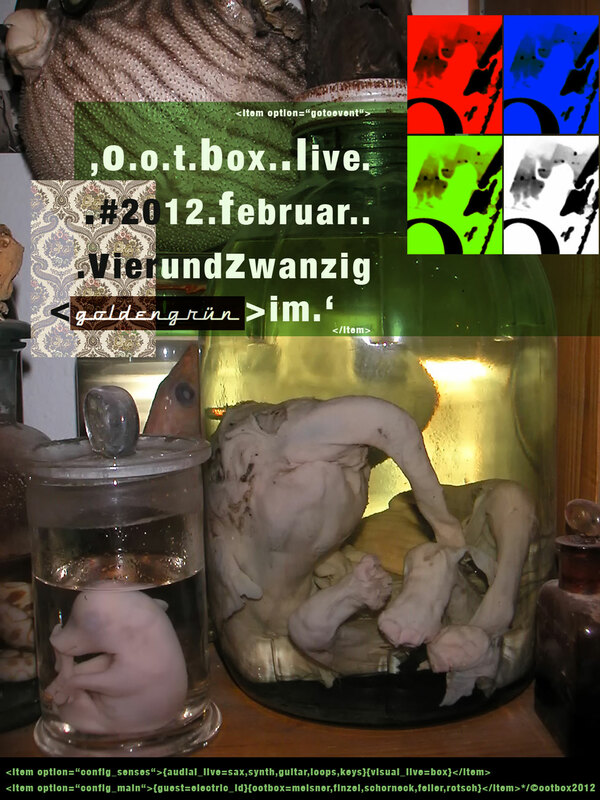 We now define “Out of the Box” as a combo, a project besides Visualitätenkabinett Erika, Mustermann etc.. We will no longer call it a jam-session, as a jam-style-jam-session accidentally took place and we did not find it to be the performance we should offer and you would expect (attending musicians were great, that’s not the point). 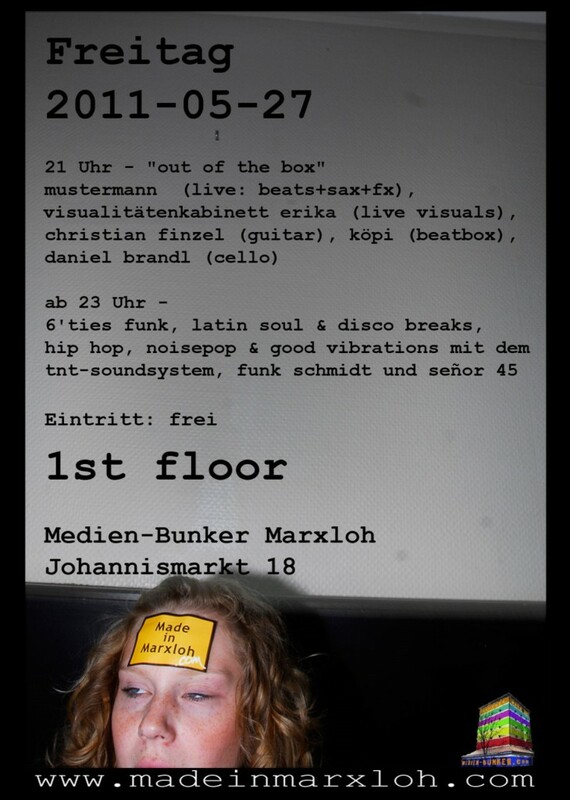 It will still be loads of Jazz and Impro, but it will be “Out of the Box” plus guest only. We are working on a proper CI and web presentations, official launch will be announced here. Released on the sixth of July, a Hip-Hop track by Oliver Lutz featuring german-turkish comedian Fatih Çevikkollu is part of a camapaign for moral courage, led by NRW department of transport and the transport companies around. Clip edited and stylized by Sven. Watch at the end of this post. Last week we published “Mein Europa“, based on a tune by italo-german singer/songwriter (and gorgeous drummer, btw.) Giuseppe Mautone. The Clip is an answer to the “Euro Crisis Song” the Guardian made public recently, which was an idea of Christian Finzel (member of “Out of the Box” and gorgeous guitarist, btw.). Our #1 Photographer at Medien-Bunker Marxloh, Rainer Kzonsek, brought few, but captivating shots from a huge demo in Barcelona some two weeks ago. With music and footage like that, Sven had a walk-over in editing a story. Have a look at the outcomings at the end of this post. Last, but – at least felt – not least we are glad to announce a new project called “Erika und der Bass”. Expect some exquisitly grimy, glitchy, groovy music and clip releases in the near future. It will be our pleasure to meet all of your ear- and eye-candy needs with our upcoming record, clip and performance novelties.